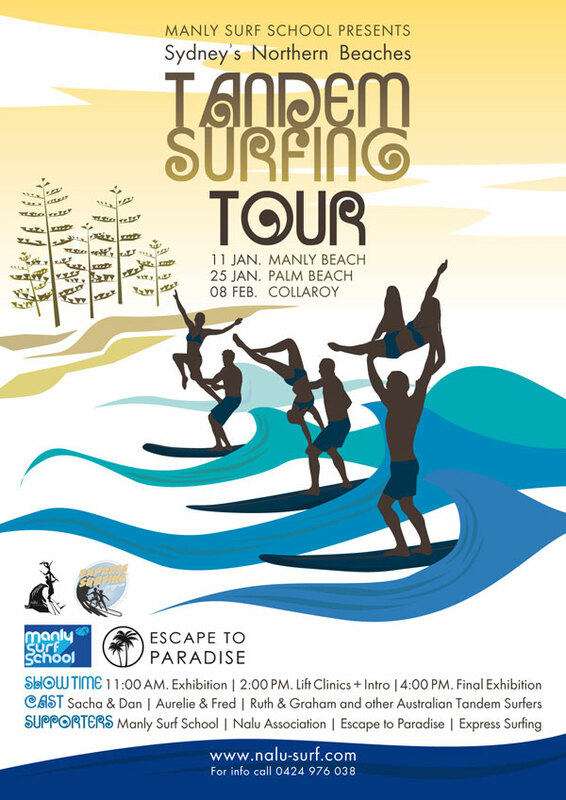 The final stop of the Northern Beaches Tandem Surfing Tour presented by Manly Surf School will be taking place this coming Sunday, February 11th at Collaroy. The event will feature several tandem surfing exhibition performed by local and international teams. Expert advice from the teams and big tandem boards will be on hand for people to give the Hawaiian art of tandem surfing a try. Couples can simply ride the waves together or learn to perform basic lifts to grace the surf together on a single board. Previous stops of the tour at Manly and Palm Beach have both been a great success, blessed by beautiful weather, nice waves and great turnouts,including photographers, surf journalists and TV crews. On both occasions the tandem surfers were greeted with claps and cheers as beach goers and surfers alike watched this original ballet with astonished eyes. Not only can tandem surfing be a great spectacle, it is also an excellent way to enjoy the waves with your loved one: surfers can share their passions with their kids, girlfriends, boyfriends, siblings or spouses and even their grandparents! Matt Grainger of Manly Surf School is a great supporter of tandem surfing. He often uses the school's tandem boards to go surfing with his students or give physically and mentally disable children safe surfing experience they'll never forget!